Vietnam Tour Booking provides many land tours and cruise tours in the most popular destinations of Vietnam, Laos and Cambodia. 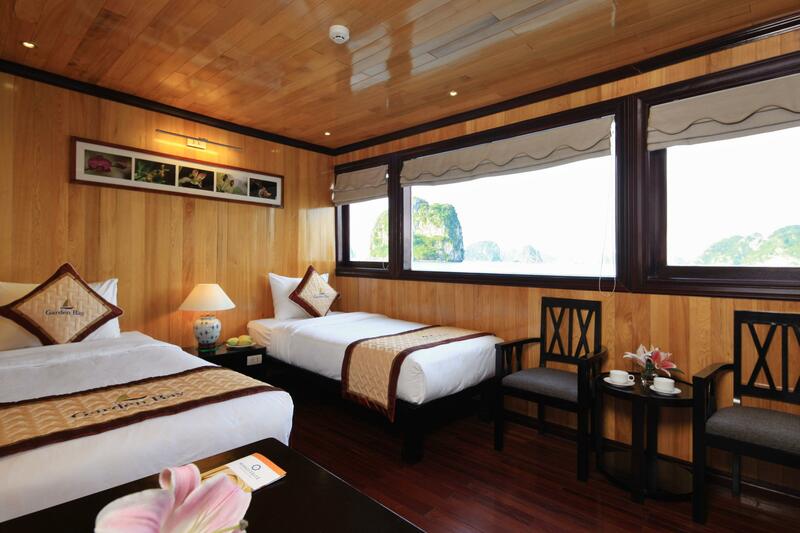 Besides the breathtaking vistas of Halong Bay, customers on board with Garden Bay Luxury Cruise will have perfect time to explore the local life at floating villages and cruise on less touristy itinerary. There also have interesting relaxing activities such as swimming, fishing, and kayaking. No matter how many times you happen to visit Halong Bay with us, you will find that it presents entirely new pictures and experiences. 07:30 - 08:15 Optional pick up at hotel for three and a half hours road trip with short refreshment on half way to Halong Bay. 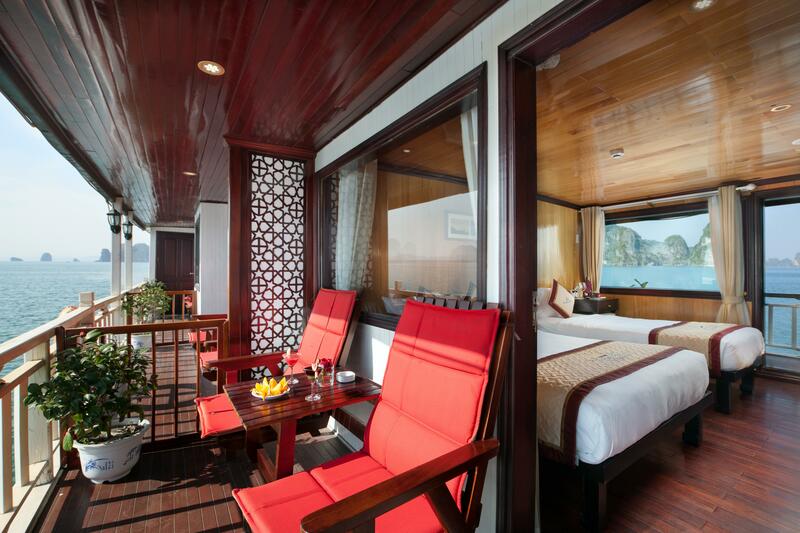 12:45 Enjoy a welcome drink onboard the Tonkin Cruise boat. 16:30 Swimming, Sunbathing and Relaxing at Ban Chan Beach. 17:30 Relax and enjoy the sunset cocktail while the boat is cruising to Cong Dong - Cong Do area. Docking for overnight. 06:30 Doing exercises with Tai chi on the sundeck. 12:30 Having Set lunch with seafood and grills. 06:30 Rise early for morning tai chi on the sundeck. 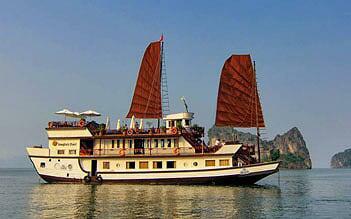 07:15 Enjoy a light breakfast while cruising to Thien Canh Son cave. 12:00 Transfer by tender to the pier, relax inside our waiting lounge and waiting for return transportation. 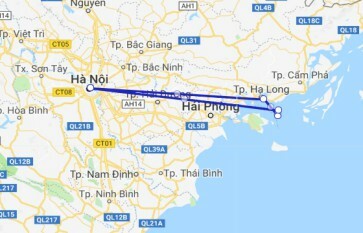 16:30 Drop-off at hotel in Hanoi. On the way from Halong Bay to Hanoi, you will have a short break at Yen Duc Village – a typical Vietnamese agricultural village which is rich in culture and traditions. This is a great chance to visit the charming fields while wandering narrow alleyways in the odorous fresh air and enjoying the WATER PUPPET SHOW. Staff were fantastic, friendly and helpful, doing everything they could to make the cruise enjoyable and memorable. The food selection and meal service was great with more than enough for everyone. 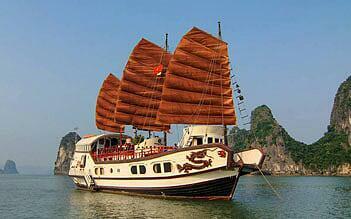 The boat itself is quite old, but similar to others and exuded an old world charm making for a relaxing time. This was a really great experience however I would recommend the 3days and 2 night because we did the shorter option and it was just not enough time, it all feels a little rushed. Also get a room with a balcony because they are generally much nicer. Very good time in Ha Long Bay It was very good. Room was very clean but the boat is a little bit old. 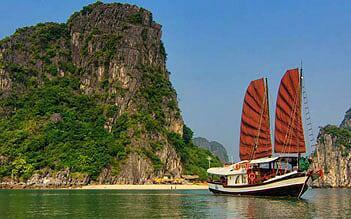 It was a great experience to Visit Ha long bay with the staff who knows places to visit. Staff was very polite and helpful.